Just click on the image and it will take you directly to our DoTerra Web site. Passionate about natural health and wellness for families, DoTerra adds another branch in our effort to help our customers. To get to our unique DoTerra site just click on the picture. Our DoTerra journey began when NOTHING would stop the bronchitis we suffered with for two months. Then someone offered us a sample of Breathe and a hand held nebulizer and in 3 days we were healed. After that, our daughter became sick. I traveled to Little Rock and set her up with oils for her symptoms. Again, in 3 days her symptoms had subsided and she was on the road to recovery. Since then, we've incorporated them into almost every facet of our lives. Dennis has lost 17 pounds, feels great and can now wear regular shoes (as opposed to special formed lace up boots). This was a HUGE change for him. He is also off all his over the counter pain medication for shoulder pain stemming from 4 shoulder surgeries. DoTerra has truly changed our lives. What IS an essential oil? This short video gives wonderful information on what they are. How Do I get these Precious Gifts From the Earth? In addition to wonderful, tested products, we offer you support, training on oils and will plug you into an awesome Facebook Group page (for team members only) that will provide you with lots of information on all of DoTerra's products. Our motto 'Don't let friends buy retail' gives you the opportunity to receive 25% off retail prices immediately if you click on 'join and save'. We suggest you join as a 'wellness advocate' in case you should ever want to move into the business side of DoTerra with residual income. You can work yourself up to saving 55% on these products in a very short time. 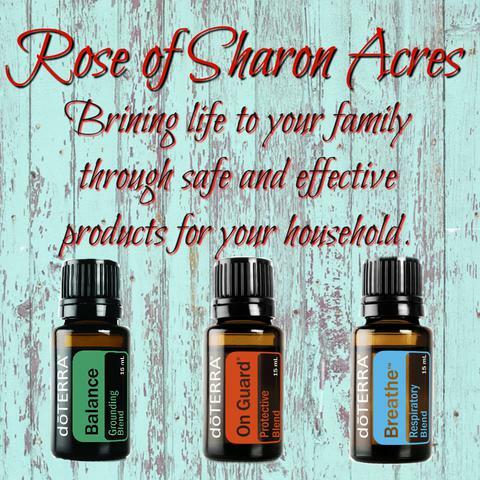 For questions, you can contact us through Rose of Sharon Acres or contact us through the DoTerra site. We look forward to serving you!